Saturday, 7th April, 2012 - Hazeldean Road, Harlesden, London, NW10. collaboration with the Jamaica High Commission and the Federation of Reggae Music (FORM). THE MIGHTY TWO "IN MEMORIAM"
Release Date : 2008 ? "Say What You Say" and adopting a wise but never patronizing tone in the anti-runaway "Stay At Home". The musicians: "The Professionals", featuring Gibbs' usual suspects, is tight and groove-oriented throughout. "As many of DEB Music fans are aware, Dennis Brown’s classic album “Wolf & Leopards” originally released in 1977 was released as a joint catalogue between D.E.B. 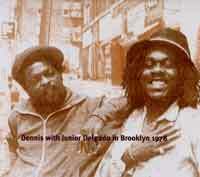 Music (Dennis Emmanuel Brown) and Morpheus (Castro Brown). Those who noticed that one of DEB Music’s album “Black Echoes” was originally catalogued as DEBLP02 will also point out that catalogue no. DEBLP01 was missing. For those who might have wondered if there was another album which could be in fact DEB Music’s very first release, Badda Music is delighted to announce great news. Badda Music have found master tapes of the very first album produced by DEB Music which were clearly catalogued as DEBLP01 with Dennis Brown’s hand writing and also titled as “Brothers”. Recording year, 1977 and the artist is Junior Delgado who was only 19 years old at the time and spending most of his time with Dennis Brown just like Dennis Brown’s real brother. This album is to be not only DEB Music’s first release but also Junior Delgado’s first album. The history has been re-written." 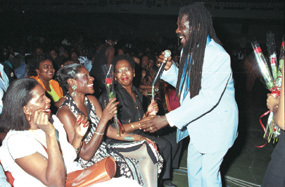 Two days after his 49th birthday and going on to seven years after his death, an appreciable audience came to the main parking lot of the Oakton Entertainment Complex in Half-Way Tree for the Jamaica Association of Vintage Artistes and Affiliates' (JAVAA) first major show at their new home. 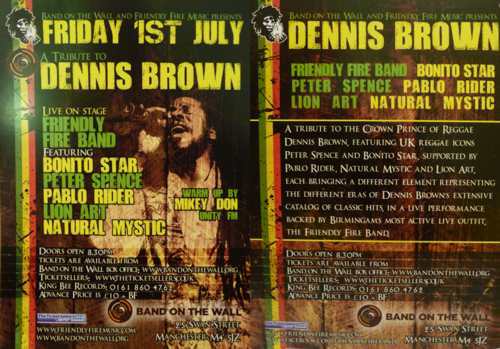 Jamaica's coolest radio, Kool 97 FM, has collaborated with the Dennis Brown Trust and the Edna Manley School of the Performing Arts to salute Dennis Brown on February 1, 2005. This year's tribute will be the third staging, and will explore the many musical gems from the Prince as well as Dennis Brown Live concerts, exclusive interviews and features on Copyright contributed by top recording artistes who have worked with D. Brown. The focus this year will be a Copyright Expo from the Edna Manley School of the Performing Arts. The Copyright Expo is a forum, which will address the Copyright Regulations in the music industry and will draw Speakers from every sector of the entertainment and publishing industry such as JAVAA, JIPO, JCAAP and Radio Personalities / DJs. Supporting this Expo are international publishers from the UK, namely Pablo Publishers Ltd, Dennis Brown Music and Greensleeve Publishing. The Expo is open to students from the Tertiary level and will be broadcast live on Kool 97 FM. Kool 97 FM will feature D. Brown in a Music Marathon from 9am to 9pm, which will be streamed live on the World Wide Web at www.kool97fm.com. Jamaica Citrus Growers and Cooyah Designs and Supplies are sponsors of the Music Marathon and the outside Broadcast from the Edna Manley School of the Performing Arts. "UMOJA LOVE And UNITY" / "20TH CENTURY DEBWISE"
Sunday, 1st February, will mark the 47th anniversary of the birth of the late reggae star, Dennis Brown. The 'Crown Prince of Reggae", as he was know to his many fans at home and abroad, provided the impetus to generations of Jamaican singers who developed on his style, including the late Jacob Miller, Richie Stephens and George Nooks. But, since his death on July 1, 1999 at the age of 42, hardly anything has been heard about his posterity. Not so, says businessman Junior Lincoln, who heads the five-year-old Dennis Brown Foundation, which seeks to foster his name and achievements. "Just give us another five years and you will be surprised at how much we will have achieved. We are making a lot of progress," Lincoln said. 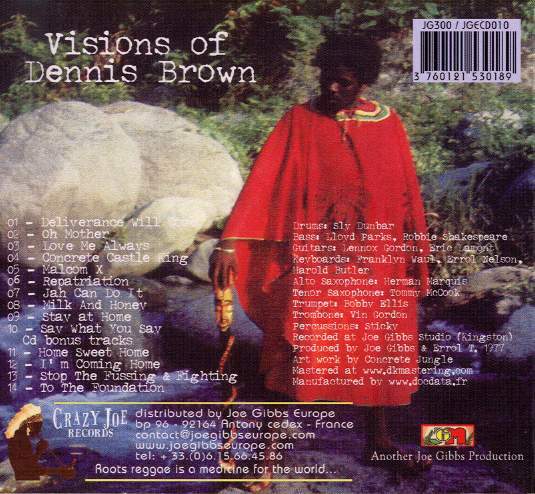 However, some Dennis Brown fans maintain that not enough has been done to cherish his achievements. They still rue the fact that he was not given a state funeral, no national honour or a monument over his grave at National Heroes Park. "That was probably due to his lifestyle or people's perception of his lifestyle," said one former colleague who did not wish to be named. Lincoln says that in time the Foundation will address all the issues left in the wake of his untimely death. He claims that the reason Brown was not given a national honour was because these honours are not given posthumously. But, according to Jamaica Federation of Musicians president, Desmond Young, that was not an official explanation and in addition, up to recently other artistes have been honoured posthumously. "I think he should be honoured," said Tommy Cowan, who handled Brown's bookings up to the time of his death. "His talent and contribution outweighed that of many people who have been honoured but, unfortunately, they look more at the perception of him rather than what he actually achieved." According to Young, the JFM will be putting forward his name for national honour this year. "We will be doing our part and we wish that all the people who feel the same way will make their voices heard, too," Young said. He added that being buried in Heroes Park was a signal honour for Brown, but not enough. Brown certainly has held the respect of his fans and contemporaries, though. Last night (Thursday) at a press reception at the Knutsford Court Hotel, a five-day programme to honour his memory was revealed by his former associates. 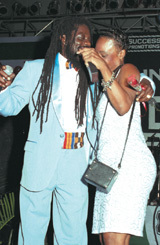 The Jamaica Association of Vintage Artistes and Affiliates (JAVAA) will be playing an important role in these celebrations starting with a show at their headquarters, 30 Haining Road, Kingston tonight, featuring Brown's former backing band, Lloyd Parkes And We The People, and artistes performing the late singer's best-known songs. Saturday again at the same venue, they will be taking turns selecting his recorded music. On Sunday, several radio stations are expected to pay tribute by playing his songs. Kool 97 will be running a marathon of his music from 10:00 am to 10:00 pm. On Monday, two of London's best-known reggae radio disc jocks, Miss P from Radio London and Ernie from Choice FM, will be doing a live link-up from Kingston. Since its inception, Brown's Foundation has concentrated on offering scholarships in his memory to students of his primary alma mater, Central Branch in West Kingston. So far 15 children have benefited from these scholarships. "It is our intention to take them all the way through to their tertiary education," said Lincoln. He says that the scholarships were funded from the Foundation's own fund-raising efforts and not from Brown's estate. In terms of Brown's estate, they have now completed sorting out the administration of his publishing, sources have confirmed. The next step was to sort out the complicated discography entangled in a web of producers. over the next few years. All of this is being done through agents in London, however. "Our vision is to rebuild him into the icon he should really be. It will take time, but we are making progress," Lincoln added. legendary producer Clement "Sir Coxsone" Dodd back in 1970. His hits include No Man Is An Island, Silhouette, Should I, Stop Your Fighting, Revolution, Cassandra, Westbound Train, Love Has Found Its Way, Money In My Pocket, Love's Gotta Hold On Me, Inseparable, Some Like It Hot, Love And Hate, How Could I Live and Wolves and Leopards. 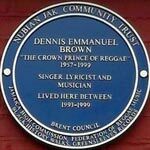 London's number one urban music station, Choice FM, and Jamaica's koolest, Kool 97 FM, have collaborated with the Dennis Emanuel Brown Trust to salute Dennis Brown. Choice FM currently broadcasts to approximately six million potential listeners in London, a figure that will soon increase considerably after they join forces with broadcating giant Capital Radio. 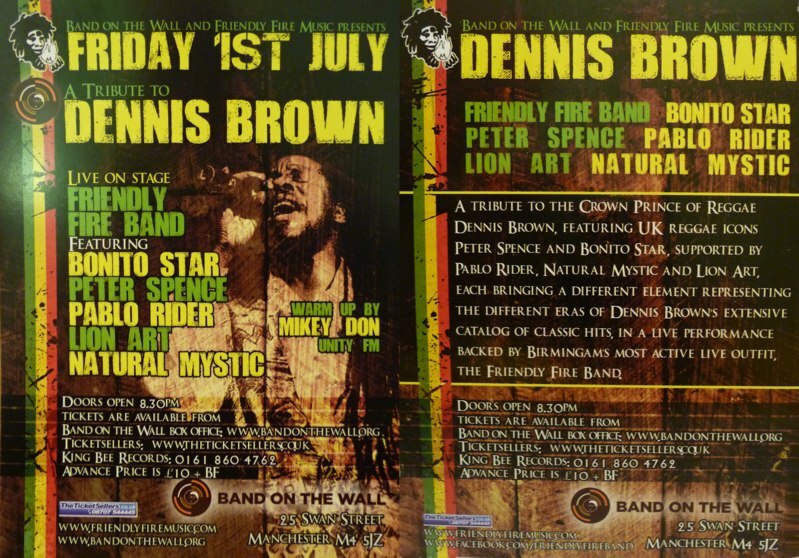 Experience this two-day musical extravaganza featuring a twelve-hour Dennis Brown marathon Sunday February 1 from 10am to 10pm. The marathon will feature Kool Deejay's Stokey Love, Michael Thompson, Michael Barnett, Peter Phillips and Robert Blake as well as top disc jockey and MOBO Award nominee from Choice FM, Daddy Ernie and Ms P from BBC Radio London. Join Kool 97 FM once more on February 2 for a two-hour live link with London from 2-4 pm during Kool Rhytrhms with Patrick Lafayette and Daddy Ernie. This event explores the many musical gems from the Prince, as well as Dennis Brown live concerts, and exclusive interviews with his top producers and international stars in the music industry - plus David Rodigan reveals his favourite Dennis Brown hits. Join Kool 97 FM and Choice FM as they pay tribute to Dennis Brown and his invaluable contribution to reggae music both at home and abroad.